Violence in Egypt. Who is to Blame? 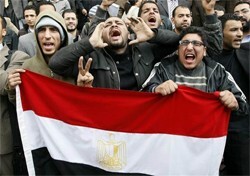 Destabilizing Egypt is part and parcel of Pax Americana’s “Crisis Management” strategy in Africa. The USA wasn’t about to sit back and watch as the beginnings of a transition to an independent government in Egypt was taking place under the Morsi lead Muslim Brotherhood so voila! coup de grace! Pax Americana always preferred the brute force policy of Mubarak and following the popular explosion in January, 2011 that brought down their vassal they were waiting in the wings ready to bring back the old regime. The Egyptian military didn’t have to think this one up on their own, they got it right out of a manual at one of the many sessions they have attended for the past 30 plus years at various military war colleges in the USA. Cut off electricity during the hot weather, deliberately restrict fuel supplies and of course full watts of propaganda on how “25 million people signed a petition against” the Morsi government. Classic destabilization campaign. To be blunt, the USA will cause the Egyptian people to wage war against themselves before it will allow any sort of transition to an independent government in Egypt. The Egyptian Army will still get its salaries and if matters become so unstable that it can no longer be relied upon to “protect” the Suez Canal, through which all the trade between Europe and Asia flows, then there are always UN “peacekeepers” to do the job. So let the Egyptians kill each other, its called crisis management, as in create a crisis and then manage the ensuing chaos to better enforce Pax Americana in a most critical region of the world. The USA’s destabilizing of Egypt is just a part of the greater “crisis management” strategy in East Africa’s Red Sea region, the best example of which is the giant “Millennium Dam” being built by Ethiopia on the Nile river. It wasn’t that long ago that threats of war were being made by heads of state here alongside the Red Sea over the threat posed by cutting off Egypt’s historic use of the Nile waters by Ethiopia’s new mega damn. A closer look at this new dam, something one will not find in the western media, reveals that it was the creation of the World Bank, 51% owned by the USA. The dam itself is supposed to produce 6000 megawatts when its is done, yet no one has tried to explain who is going to use this huge energy surplus. To start with 75% of Ethiopia’s 80 million+ people have never, ever, had electricity and there are no plans let alone multi billions of dollars to build an electrical distribution system for over 60 million people. And even if they did the rural, agricultural based Ethiopian economy would still only need 2000 megawatts. Ethiopia could build two or three dams a fraction of the size and price of the “Grand Millennium Dam” that would be more than sufficient for its needs and would not threaten Egypt’s use of the Nile waters. It was all Pax Americana’s doing to start with, helped along by some “Abyssinian Imperialist” ambitions, that now posses such a serious threat to Egypt’s survival that dire threats of regional warfare were made. Its called “crisis management”, take a perfectly solvable problem and turn it into a potential explosion that will prevent any further attempts at regional economic and political integration i.e. Pan African cooperation. That the USA is behind the destabilization of Egypt is no secret here along the Red Sea with senior leadership from our region speaking publicly about the problem. Pursuing peace is never popular with Pax Americana, especially along strategically critical choke points like the Suez Canal and the “Gate of Tears”, Baab Al Mandeb, the mouth of the Red Sea into the Indian Ocean. Crisis management wont allow it. The saying goes “All Road to Peace in the Horn of Africa and Red Sea run through Asmara”, Eritrea which is trying its best to promote principled dialogue and diplomacy to try to prevent the damage inflicted upon us under the strategy of “crisis management” by the purveyors of destabilization and violence, the USA. And the masses fell for the trick….sigh!